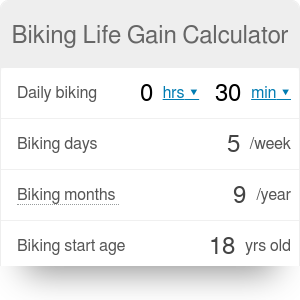 With Biking Life Gain tool you can evaluate how much longer you'll live in average if you bike on a regular basis. Biking is healthy - that's a no-brainer. It's way cheaper than riding a car and even using public transportation, it gives you flexibility (you clearly cannot be late for your own bike ride!) and a chance to actively spend your commute or a free afternoon. That's why in a lot of places the number of cyclists on the streets is growing rapidly every year and in some biking has already become the main way of daily commute for locals. The Netherlands are one of the best examples and if you ever had a chance to visit Amsterdam or any other Dutch town you clearly will know what we're talking about. To get more scientific data about effects of regular biking a group of researchers at University of Utrecht's Healthy Urban Living program ran an interesting research. They gathered data about the transport choices of 50,000 people living in the Netherlands. Across this group people ride a bike for an average of 75 minutes per week and they concluded that it equates to living longer for about 6 months. Because of this healthy habit around 11,000 premature deaths are prevented every year in the country. Please note that the research was ran on a group of amateur bikers who used a bike mostly for their daily commute. Although our tool allows you to insert any numerical values, the results won't be so accurate if you're a pro and spend most of your day on a bike (we wish you could live 20 more years though!). Calculator takes into consideration average speed of commuting on bikes in the Netherlands which we assume is somewhere between 12 and 20 kmph (7-12 mph). If your rides are more intense than that you'll probably live even a bit longer, good for you! Feel free to also adjust your country's life expectancy to get you the most accurate information. Biking Life Gain can be embedded on your website to enrich the content you wrote and make it easier for your visitors to understand your message.